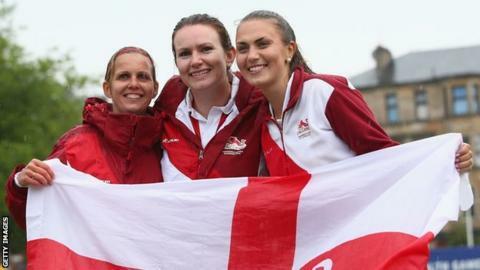 England thrashed Australia to win Commonwealth Games gold in the lawn bowls women's triples. The trio of Sophie Tolchard, Ellen Falkner and Sian Gordon won the first end 5-0 and never looked back as they ran out 22-4 winners. Wales missed out on the bronze medal as their team of Lisa Forey, Kelly Packwood and Kathy Pearce were beaten 23-14 by South Africa. England also picked up bronze in the Para-sport open triples B6/B7/B8. Bob Love, David Fisher and Paul Brown trailed 12-8 to the Scotland team of Billy Allen, Michael Simpson and Kevin Wallace with three ends to play but won the final end 4-0 to run out 16-12 winners. The gold medal went to South Africa, who beat New Zealand 13-11 in the final.